1 of 1 Coat slow cooker with nonstick cooking spray. Combine 1 small head cauliflower, cut into florets, 1 lb diced potatoes, 1 bunch chopped red Swiss chard stems, trimmed slightly (reserve leaves for later), 1 medium diced onion and 1 can (15.5 oz) drained and rinsed chickpeas. Stir in 2 tbsp olive oil and 1/4 tsp each salt and black pepper. 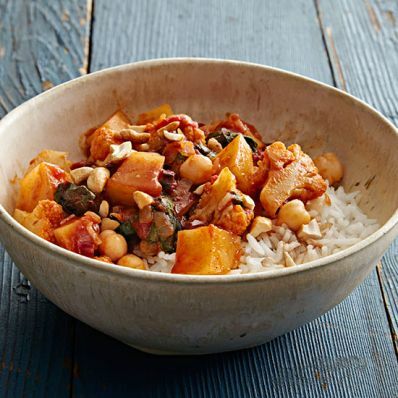 In a bowl, combine 1/3 cup mild curry paste (such as Patak), 1/2 cup warm water and 3 tbsp packed light brown sugar. Add to slow cooker along with 1 can (14.5 oz) diced tomatoes and 3/4 cup golden raisins. Stir to blend. Cover and cook on HIGH for 5 hours or LOW for 7 hours. Chop Swiss chard leaves and add to slow cooker. Cover and cook 30 minutes. Gently stir. Serve curry over 3 cups cooked basmati rice. If desired, top each bowl with a few chopped cashews and a dollop of yogurt.